Below, you'll find my more detailed reviews about the snowmobile gloves, but you can also click the links above to see current prices or read customer reviews on Amazon. Good gloves are everyday snowmobile gear. 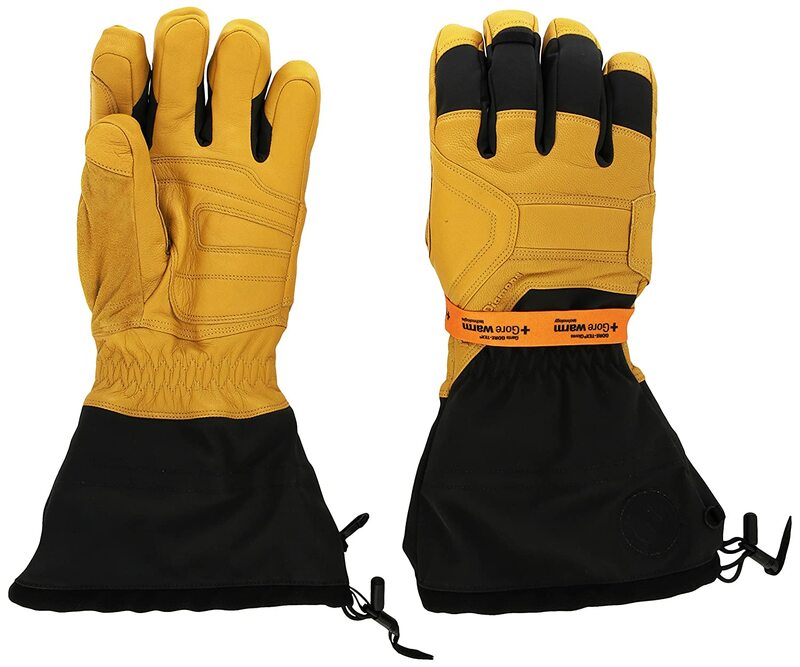 You need them for protection against the elements and for getting a good grip on the controls. Durable palm grips and flexible fingertips are necessary to hold on and perform simple tasks. For fast rides in harsh weather, you’ll need with additional insulation and protection to stay warm and confident. But for mainly short trips to get provisions, heavyweight models would not be that essential. And if you’ll be going through wet shrubbery and rainy ground, waterproofing will be critical. 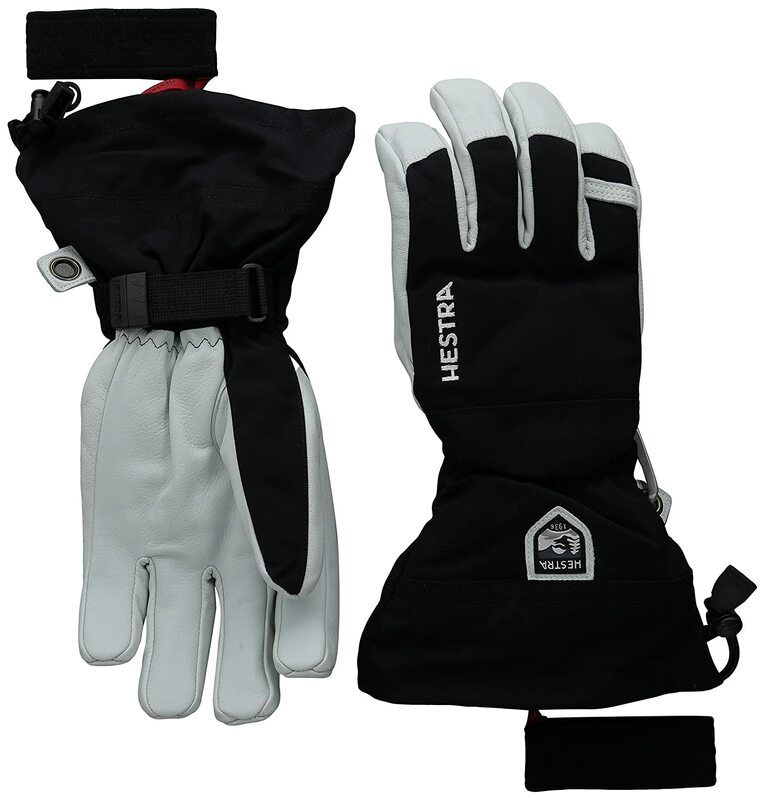 It’s great that there is a wide range of well-designed glove that feature good of padding and insulation. You should be able to find the best snowmobile gloves that fits your hands well and enhances your riding style. The important thing is to enhance your grip and protect your hands from injury. When choosing a pair, look for high-quality leather and tough stitching around areas exposed to wear and tear. Choose models with abrasion-resistant padding on those parts of your hands that are more likely to be rubbed or hit, especially your palms. Double-layered gloves have detachable insulating linings underneath outer shells, which typically keep them warmer than single-layered models. Single-layered gloves combine the insulating and outer layers in a single body, and don’t usually retain as much heat. Double-layered liners/shells are separable for faster drying, while single-layered gloves are usually easier to remove and their bodies are formed for greater dexterity. Gauntlet-type models have fabric that extend past the cuffs, making them easier to remove or slip on since there’s no need to tuck them under your sleeves. Cuff-style gloves have to tuck into your jacket’s sleeves, which requires more effort. But in the wet, your hands will stay drier since water won’t be run past your cuffs and enter your gloves. Leathers are better materials than synthetics. They’re normally sturdier and suppler in construction, with goatskin the best choice for protecting the palms. Useful features such as soft fabric materials behind each thumb for wiping down visors or goggles or even your nose can be very convenient. We want to enjoy riding in comfort and safety as much as the next rider. But finding sturdy gloves that fit and protect you well can be an awkward thing. That’s why we’ve put up this guide to the best snowmobile gloves, to help you find a pair that appropriates to your riding style. We hope these reviews will help you find a pair that fits and will warm you in most riding conditions. Black Diamond Guide is an obvious pick if you’re going up north and well into snowy backcountry all day. Your hands will ride out low temperatures better, as the detachable quick-drying liners retain the most warmth of all those reviewed. The Heli is an equally warm alternative, although its waterproofing doesn’t quite match the Guide’s level. Among the best-designed gloves we’ve seen, these feature perhaps the sturdiest construction around. Leather palms and molded EVA knuckle and finger foam padding provide great protection against injuries. Thick goatskin protects the areas most exposed to wear and tear, with a tough nylon shell covering breathable Gore-Tex inserts for longer-lasting durability. With their bulked-up nylon and leather bodies and moisture-wicking and insulating layers, you can’t expect these to be as flexible as the others we’ve tried. They felt a bit stiffer than average upon purchase and first use. But after a few days of active use they did break in fine and became supple enough for our hands to operate controls with dexterity. The lining is held in place with tough Velcro strips and the cuffs can be cinched snug with one hand, although they can be difficult to release. Convenience features such as visor/goggle and nose wipes behind the thumbs are effective. Bear in mind that the sizing tends to be on the bigger side. There’s no question that these are the best snowmobile gloves for extended use in the coldest conditions. Their waterproofed and robust construction and extra-warm fleece linings are the best available. While not as good at retaining warmth, this double-layered and waterproofed model has slightly more flexibility than the Guide does. Durable army goatskin and nylon construction are used, although the palm materials are less robustly sealed along their seams. Fleece linings are kept in place by a thick Velcro strips and are detachable for quicker drying. The keeper cords enabled us to do off-board tasks with our gloves off, with less worry that they might drop and get lost while we were seated or on lifts. Wide Velcro closures ensure a better body fit. The gauntlets can be cinched tight with just a single hand, although they can be more difficult to release than the others we’ve tried. In general, this model has slightly larger sizing in comparison to the rest, except for the Guide. It’s great for wet and snowy climes such as up the Pacific Northwest, but the palm pads will need more protective treatment than the others reviewed here will. Hestra’s Army Leather Heli Ski is among the warmest we’ve tested, with a serious design that emphasizes its ability for hard yet safe play. It may not match the Guide’s insulating performance in the coldest conditions, but it will allow your fingers with more dexterity on the run. These waterproof nylon gloves are a great choice for most riders. They’re sufficiently warm for everyday use and provide good protection against the elements. Their moisture-wicking and breathable liners are encased in shells that had the most flexibility of all the models reviewed. They are also effective in the wet given their high water resistance. Only basic features are offered, including nose and visor wipes behind the thumbs and extra-large grab loops for pulling the gloves off with freezing hands. Wrist Velcro closures to make it easier to tug your cuffs over their sleeves. 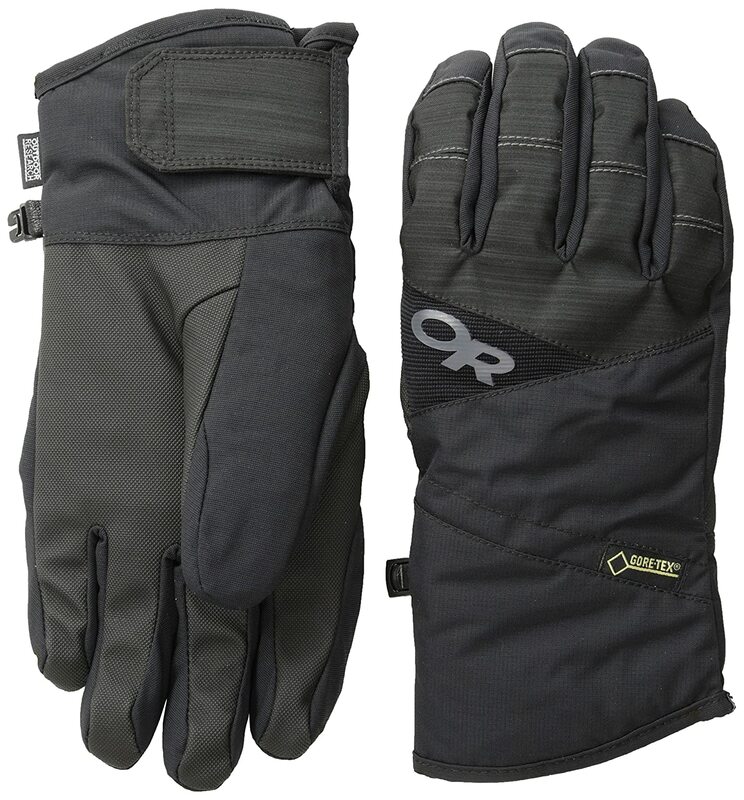 The linings may not retain enough warmth in really cold temperatures under 10 F.
Outdoor Research’s Centurion gloves provide some of the best performance in their price range and are our top value choice, although they may not be best in the coldest snow. This pair is among the better-priced waterproofed models in its range. It’s hard to think of a better model that won’t cost you another thirty dollars or more. The sturdy palm areas are lined with leather, and the insides have unexpectedly thick insulating layers lined with quick-drying smooth fleece. They were pleasingly warm on colder days and easy to slip on even when our hands were wet. This gauntlet model has an easy-to-use closure and a host of useful features. Such as large pulls loops, cinch straps and detachable tethers at the wrists, and even soft thumb wipes behind to wipe down nose and visors/goggles. These are good all-purpose gloves for use in mild winter while riding around resorts and through wet terrain. They will stay warm and remain suppler for longer than most other comparably priced models and will make a good "down" pair for riding the backcountry. Outdoor Research’s Revolution is a lot of winter glove for the money and a sensible choice for all but the longest and coldest runs. Buying a set of snowmobile gloves can be a chore to do. You’ll not only need to keep your hands warm, you’ll also need a waterproofed and flexible design for greater protection and agility in most situations. It’s a good thing there are a number of well-designed models with good amounts of padding and insulation to suit the needs of different riders. 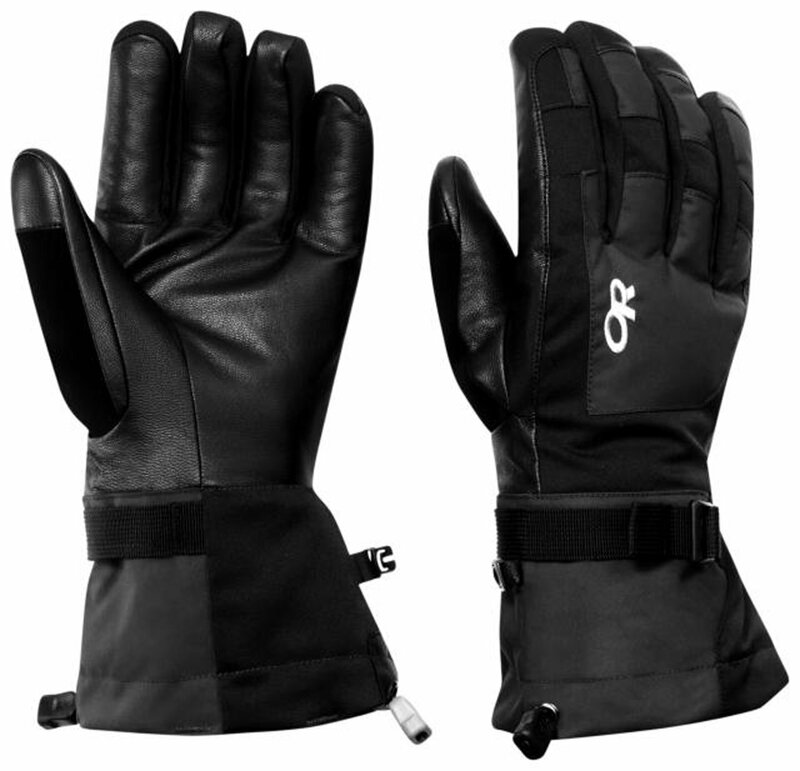 We think the sturdy Black Diamond Guides are the best snowmobile gloves for use in the coldest weather. Outdoor Research’s Centurion offers good performance for the money and are our budget pick. Whatever you choose, make sure to get a protective pair that fits well and stays warm enough to keep you confident on the go. If you liked this article, do leave a comment. Let us know what you think of these reviews of the best snowmobile gloves.